A coroner has delivered a narrative verdict into the death of Amber Peat . Assistant coroner Laurinder Bower said she could not be sure if Amber intended to kill herself after she crept into bushes after going missing from home and hanged herself. 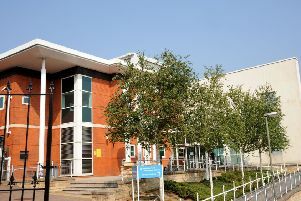 The coroner was speaking at Nottingham coroner’s court this afternoon at the conclusion of a four week inquest into the death of the tragic teen. She said: “I am not able to assess in the balance of probability Amber’s intention at the time of her death. “I have been hindered by the lack of information gathered by professionals as to Amber’s thoughts wishes and feelings. “If the right questions had been asked the information may have told me but I cannot speculate what that information may have been. “With that in mind I’m left with the option of returning a narrative conclusion. Amber died shortly after 17.50 on Saturday May 13 2015 inside a hedgerow off Westfield Lane as a result of hanging. The coroner added: “Her intention at this time cannot be ascertained. In the 18 months leading up to death education, health and social care agencies all held information about safeguarding risks to Amber. “However there were no less than 11 missed opportunities for those agencies to assess Amber and her family under a common assessment framework or early health assessment program. The inquest has heard how Amber told teachers she had been punished by stepfather Danny Peat by making her wear baggy jogging bottoms . She had been accused of lying by her parents but the coroner found she had been telling the truth. “This was perhaps borne out of the frustration that he was feeling towards Amber rejecting his attempts to discipline her. On the day she had left home for the last time Mr and Mrs Peat had sought to present as concerned parents . This morning the inquest heard from social care expert Dr Cath Connor who changed evidence she had given under oath at the inquest last Friday. Last Friday the inquest heard that evidence that social services had not been aware Amber had been strangling herself with ties until after her death. Dr Connor, the author of the serious case review following Amber’s death had said that on the balance of probability it was likely Amber would not have taken her life if social services had been made aware of her ordeal and intervention had taken place. “On reflection It is possible there would have been a different level of support. Whether that would have impacted on the outcome was not possible to say. The coroner said the inquest had been a damning indictment of those agencies charged with safeguarding children. The agencies placed too much emphasis on maintaining a good relationship with the parents rather than challenging inconsistencies. “The death of Amber was tragic and our thoughts are with everyone who knew her. “We owe it to Amber to learn from what happened and Nottinghamshire Safeguarding Children Board commissioned a serious case review to examine what could be learnt that would lead to improvements in the protection of children.